Flint, Michigan is preparing to replace the city’s high-risk lead water pipes to improve the quality of drinking water and remedy widespread lead contamination. The state has also found a dangerous chemical compound present in the Flint River. Michigan has come to an agreement with Rowe Professional Services, a Flint-based engineering firm, to survey and analyze the city’s network of water pipes, Governor Rick Snyder announced Tuesday. The survey, combined with ongoing water testing, will show where the high-risk, high-priority areas ‒ those that should be addressed most quickly ‒ are located in Flint. The governor has asked the state legislature to approve a $25 million supplemental budget request that will be used to replace the water infrastructure. The legislation passed the Senate nearly two weeks ago, and a key House committee approved the spending on Wednesday, allowing the bill to be considered by the full House, AP reported. It could cost more than $60 million total to replace the estimated 35,000 or more lead service lines in Flint, state officials have said. Officials still do not know the composition of 10,000 service lines connecting water mains to the city’s homes and businesses. It will take a month for the engineering firm to identify the location of lead pipes, which is necessary before replacement work can begin, Snyder said. The survey will cost the state $500,000, according to AP. Flint Mayor Karen Weaver says that the governor’s timeline isn’t fast enough. The city is in the midst of a nearly two-year water crisis that began when Flint switched its water source from the city of Detroit, which sourced its water from Lake Huron, to the much closer Flint River as a cost-saving measure. Corrosive compounds in the river water caused lead from the city’s pipes to leak into the water supply. Lead in tap water was found to have reached dangerously high levels, and tests found that many children had lead in their bloodstream. Under the first phase of her “fast-start plan,” 32 specially trained crews would replace about 15,000 service lines at no cost to consumers. Weaver’s proposal would cost $55 million as water infrastructure experts from the Lansing Board of Water and Light train local Flint workers on lead pipe removal at a vacant property in Flint owned by the Genesee County Land Bank. Training for the workers would begin next week. 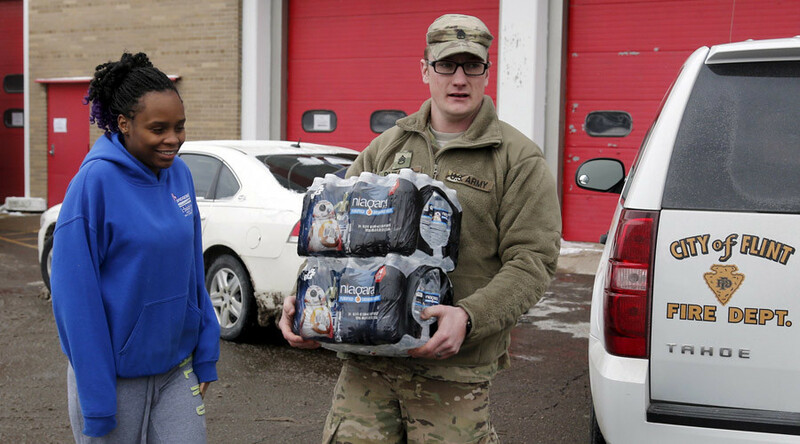 The water crisis doesn’t just include dangerous levels of lead in Flint residents, but also a sharp increase in cases of an atypical pneumonia known as Legionnaires’ disease that began in mid-January. Last Tuesday, the city issued a boil water advisory over fears of bacterial contamination due to a water main break. The advisory was lifted on Friday after testing did not reveal any bacteria during or after the repairs. A May 2015 study by the Michigan Department of Community Health, which went unnoticed until Wednesday, found elevated levels of perfluorinated compounds in the Flint River. PFCs are man-made compounds that can have devastating environmental effects, and some have been linked to cancer and birth defects. The report, which tested surface water and fish for PFCs in 13 sites around the state, was not designed to evaluate drinking water, Jennifer Eisner, a public information officer for the Michigan Department of Health and Human Services, told the Intercept. However, it did find that levels of perfluorooctane sulfonate (PFOS) in the Flint River exceeded the state’s limits for both non-drinking water and drinking water. A survey of the nation’s 500 largest water systems by public interest group Food and Water Watch published Tuesday found that Flint residents paid the highest water rates in the US. On average, they paid $864 a year for water service ‒ or 7 percent of household income ‒ which was more than 2.5 times the Michigan average of $323. "It far exceeds what the United Nations designates as affordable for water and sewer service," Mary Grant, one of the study's authors, told the Detroit Free Press. The UN recommends that water utilities should not exceed 3 percent of household income. In August, a judge ruled that certain rate increases in Flint were unlawful, and ordered the city to reduce its rates by 35 percent and to eliminate a service fee, Food and Water Watch noted. The group conducted its survey last January. At least nine lawsuits have been filed in state and federal courts since the water crisis began. On Tuesday, thousands of Flint residents met with lawyers as they seek information on joining one of the pending class-action suits, the Guardian reported. The combined liability for the state and the engineering firm hired to advise Flint on its water treatment plant could climb to $1.25 billion. Separately, a local hospital is the principal defendant in a $100 million suit claiming the medical center did nothing to combat the outbreak of Legionnaires’.